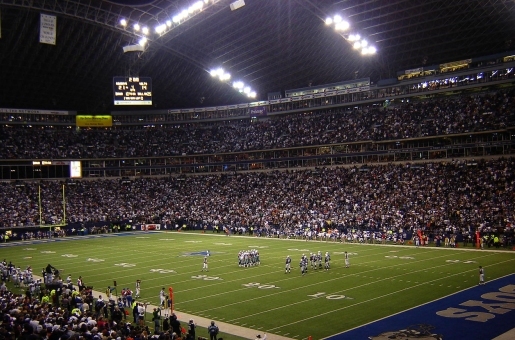 Texas Stadium, the monument to professional football’s stranglehold on the hearts and minds of Texas, had been replaced by the bigger, better, billion-dollar Cowboys Stadium by owner Jerry Jones. There’s really only one fitting way to salute the end of any football stadium, and that’s with tailgating, fireworks, and a crowd of 20,000 on hand to celebrate the power of explosives! No sissy deflation here; we’re talking the serious stuff! Bring on the demolition, whoo! Jerry Jones, ever the wise marketer, sold the naming rights to the demolition to Kraft. He also held an essay contest in which kids could write in for the chance to push the demolition button. The whole thing took less than a minute to come down, save for one small section of stadium supports that didn’t want to fall. The city of Irvine sold the rights for the property to the state of Texas for the next 10 years, with plans in place to use the area as a staging ground for a highway construction project.